We parked the Outback off at a little dirt pull-off by a highway bridge. 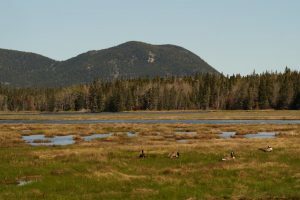 Based on several different guides and personal recommendations, this tidal marsh was high on my list of paddling destinations during my three-week stint as Artist-in-Residence at Acadia National Park, and the bridge at the outlet of the marsh where it flowed out into a harbor was the recommended put-in. My wife Deborah and I arrived about three hours before high tide in hopes of riding the incoming tide all the way upriver to the very start of the marsh—the estuary where several cold water streams flowed into the brackish saltwater. Fortunately, I had noticed another put-in a half mile back the road by a bridge over a little side tentacle of the marsh. 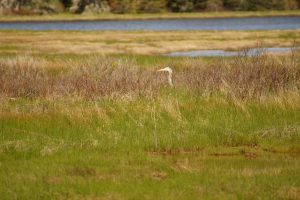 Walking down the to the shore from the alternate entry point, I caught sight of the long neck of a great blue heron—the namesake of our new ultralight kevlar Wenonah canoe model—wading through the marsh grass just forty yards away. It was a good sign. An even better sign was the nice soft grassy bank beside water, just deep enough to float our canoe. Under the watchful eye of four Canada geese browsing in the grasses, we carried the canoe to the water. A few minutes later we were paddling up the river. The first few hundred yards brought us across a wide marshy area, where our soundtrack was composed of a strong wind blowing off the harbor through trees and grass, mingled with more distant sounds of surf, and the occasional passing truck engine. In the distance ahead, we could see the wooded slopes of Bernard Mountain, Great Notch, and Mansell Mountain, the source of the cold streams that fed this estuary. 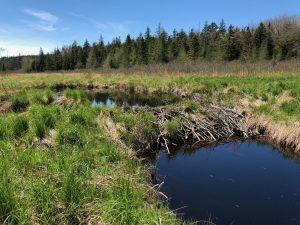 One of the reasons I had chosen this particular marsh was the purported presence of diadromous brook trout known as “salters”: a strain of native coastal trout that move back and forth between saltwater and fresh water, or which just live in that zone of brackish water where the two come together. 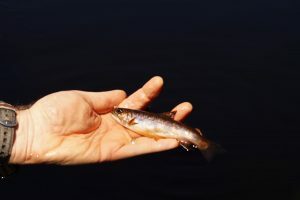 Though the fish has not been as widely studied as many other native fish, they once inhabited coastal streams from Long Island all the way up the coast of Maine. Development and habitat loss along with a mix of dams and culverts that block migration, have extirpated these salters from much of their native range. 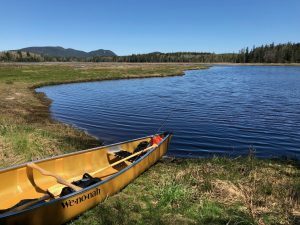 Thanks to the conservation made possible by the century-old Acadia National Park, Mount Desert Island is now one of the best remaining refuges for this fascinating little trout. 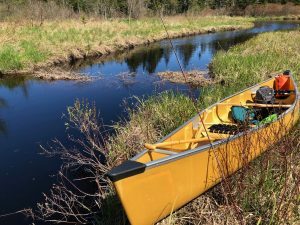 Recent collaborative efforts by the National Park Service, Wild Acadia, and local and national conservation groups (like Trout Unlimited, the Maine Coast Heritage Trust), to replace old road culverts in and around the park may even be improving the habitat and migration of these fish. Earlier in the morning, I had stopped to take some photos of alewives successfully working their way a fish ladder around a dam in Somesville that might otherwise have blocked their annual spawning migration. Another diadromous species, alewives are vitally important to the ecology of coastal Maine. 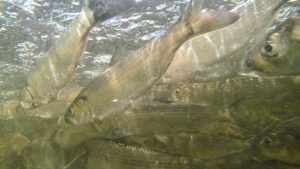 Indeed, as a primary food source for many other marine species, they are both far more abundant and thus more important to the marine and freshwater ecosystems than salters. But like salters they also depend on these coastal streams. 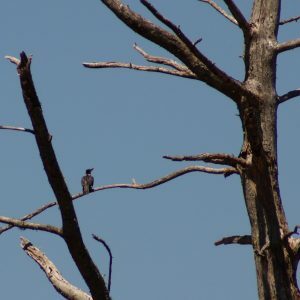 Much of the restoration work around the island focuses on the alewives, but salters are a fortunate beneficiary of several projects as well, along with rainbow smelt, an anadromous species that migrates up some of the same streams. So are American eels, a catadromous species whose migration is in the opposite direction: they spawn deep in the ocean, but then come into fresh water as adults. The fates of all these diadromous are intertwined. As I sat holding it in the cold water while my wife snapped photos. I thought it had the distinctive purple-mottled coloration I seen in photos of salters. But could it be my first one? We were above the beaver dam, and seemingly above the reach of the tide. Maybe this was just another freshwater brook trout like hundreds I had caught in Vermont over the years. I cast for another hour or so, caught glimpses of a few more trout rising for—but missing—my fly, and I landed one more, even smaller than the first. Then I noticed that the water had suddenly turned dark and risen around my feet. The dry grass I’d walked along was underwater. I looked back where the canoe sat on the shore. The beaver dam that had blocked our passage was now half a foot underwater. Tide was pushing in over it, carrying a few stray bits of seaweed. I was casting into the brackish saltwater where the incoming tide met the outflowing water of three cold mountain streams.The fish I had held in my hands were, indeed, my first salters.